With a traditional look and strong design, this vanity will help any bathroom look nicer. Its beige tan marble counter and brown solid wood base will look beautiful in your home. Put a classic feel in your bathroom with this good-looking set from Wyndham Collection. Bring a fresh, traditional look into your bathroom with this vanity. With a beige tan marble counter and brown solid wood base, this piece is very stylish. This simple vanity set from Wyndham Collection will fit right into any bathroom decor. Designed with a traditional style and strong build, this vanity is a perfect choice for any bathroom. The good-looking beige tan marble counter and brown solid wood base make a big difference in your bathroom. Put a nice touch on your bathroom's look with this vanity set from Wyndham Collection. Hatton 72-inch W 3-Drawer 4-Door Vanity in Brown With Marble Top in Beige Tan, Double Basins With a traditional look and strong design, this vanity will help any bathroom look nicer. Its beige tan marble counter and brown solid wood base will look beautiful in your home. Put a classic feel in your bathroom with this good-looking set from Wyndham Collection. 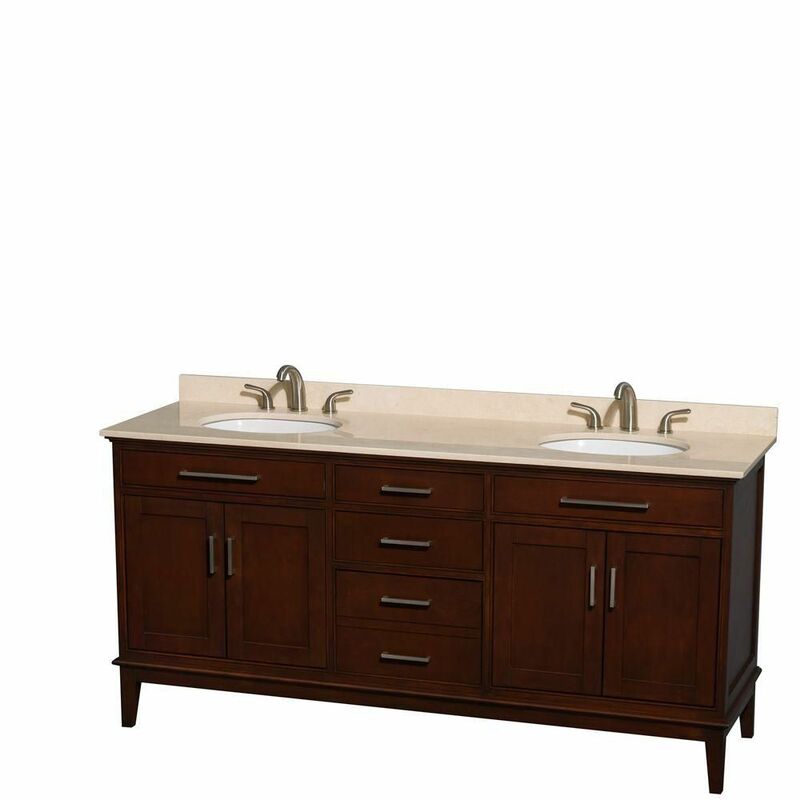 Hatton 72-inch W 3-Drawer 4-Door Vanity in Brown With Marble Top in Beige Tan, Double Basins is rated 5.0 out of 5 by 1. Rated 5 out of 5 by Judi from Very elegant design This is such a beautiful furniture piece. My bathroom looks so elegant. I love the hardwood and finish,the self closing doors and drawers. The marble top is a stunning finish for the piece. I would definitely recommend this manufacturer when considering a new cabinet in your bathroom.